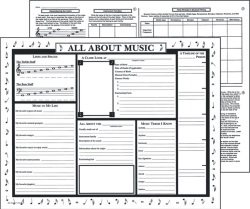 As students fill in and color these 17" x 22" posters, they learn important information about musical notes, composers, instruments, music terms, and much more. 30 copies per set. Package includes instructions for completing the posters, related activities, and a teacher's guide.